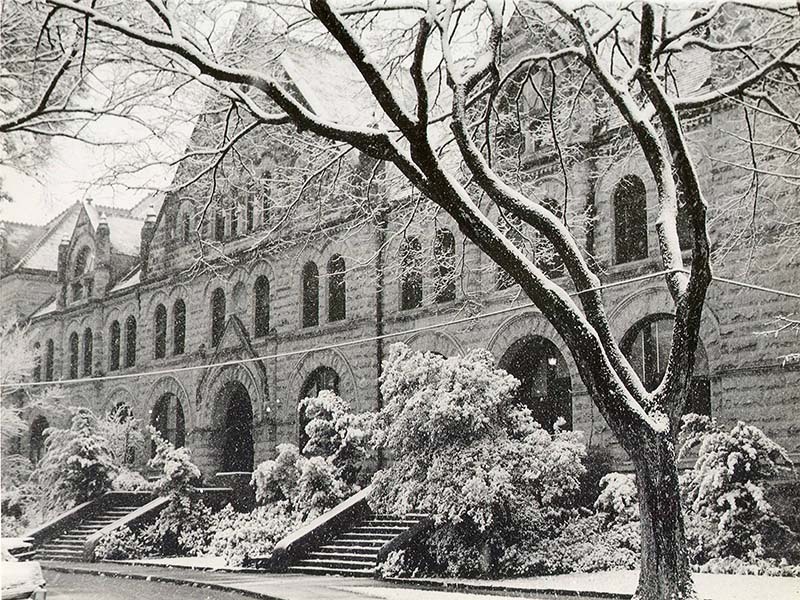 The Tulane Hullabaloo | Campus closed through Thursday for weather conditions, road closures Campus closes two days in a row for rare "snow days"
Gibson Hall covered in snow in an archived 1963 photograph. Tulane’s campuses in New Orleans, Jefferson Parish, the Northshore and Mississippi will be closed for a second day after an unexpected snowfall Tuesday night. The university is functioning under emergency operations this evening, as it was last night. Students received an email from the Provost yesterday afternoon around 5 p.m. announcing the class cancellations and campus shutdown. Around 3 p.m. today, another announcement went out cancelling evening classes and a third announcement around 6 p.m. cancelled classes again for Thursday. The campus closure is due to sub-freezing conditions and Tuesday’s hard freeze. During the campus closure, student services including Bruff Commons, the Lavin-Bernick Center for University Life, the Reily Student Recreation Center and the library remain open with some affected hours of operation. In addition, Tulane Emergency Medical Services will not be in service and guest visitation in dorms is prohibited. The city of New Orleans was under winter weather advisory yesterday and under wind chill advisory today. Schools were closed all across Louisiana, including all schools in Orleans parish. Students are encouraged to travel with caution and stay tuned for any updates from the university.